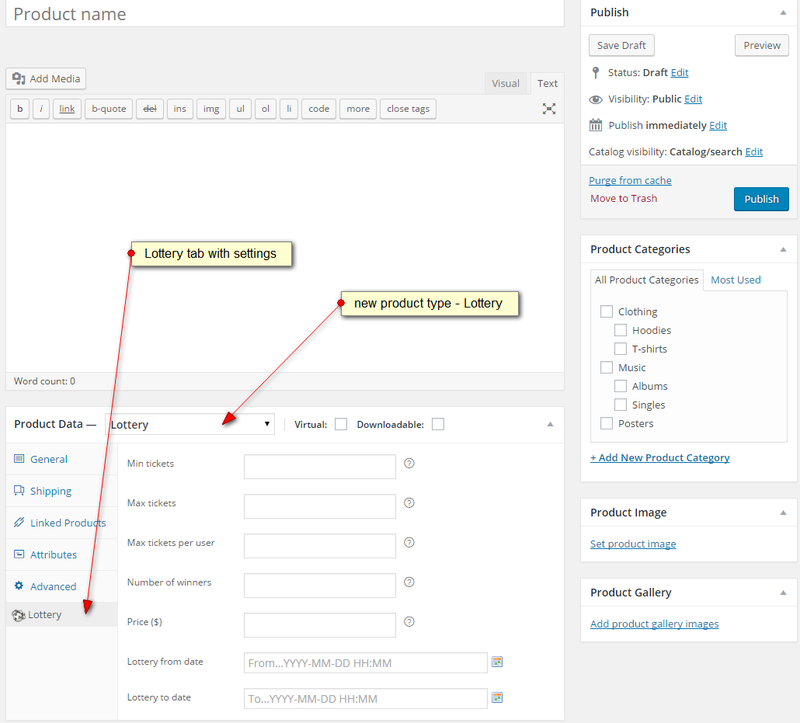 - Fix: plural translation problems in message "you have bought..."
WooCommerce Lottery is a extension for popular WooCommerce plugin and extends it with lottery features. We tried to make it easy to use but also to include all lottery features. With this plugin you will get a powerful lottery solution for WordPress which is easily setup and customized. 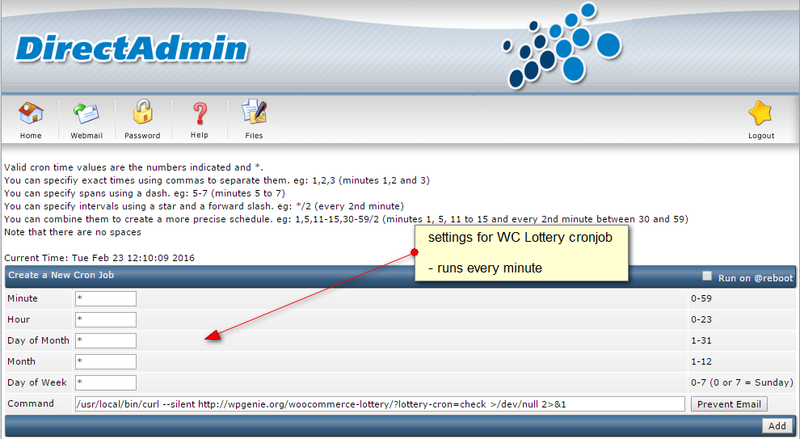 With WooCommerce Lottery plugin you can setup WordPress lottery website and start lotteries in less than 30 minutes (assuming you have payment processor account ready). 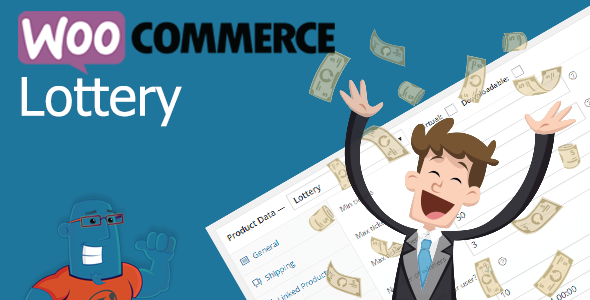 WooCommerce Lottery plugin integrates seamlessly with WooCommerce and no special knowledge is needed (same level like for standard WooCommerce usage). 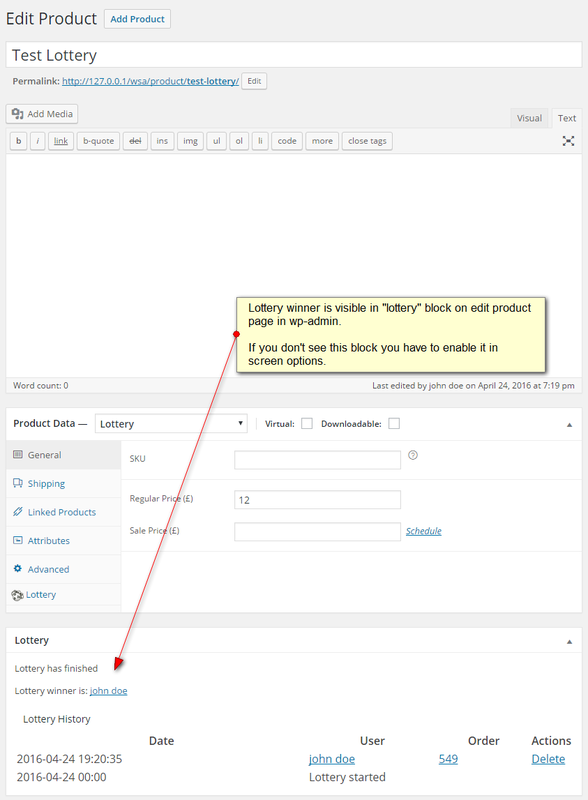 Product single page has new tab "Lottery History"
Make sure to install WooCommerce before you activate WooCommerce Lottery plugin. You can install plugin via WordPress "Add New" plugin - to do that download zip with plugin only (installable WordPress files), click add new and that's it. In case you do not have permissions to upload to plugins/ directory you will need FTP login info and upload plugin via FTP. Make sure that when setting up lottery site your lottery base page is different than your home page. If you need lotteries on home page use shortcodes or widgets to display them on your home page. Here are settings that you can turn on and off. Settings are self explainable. You can enable or disable showing past and future lotteries. Another useful setting is whether to mix regular products with lotteries or just show lotteries on separate page (defined via lotteries Base Page dropdown, see screenshot). 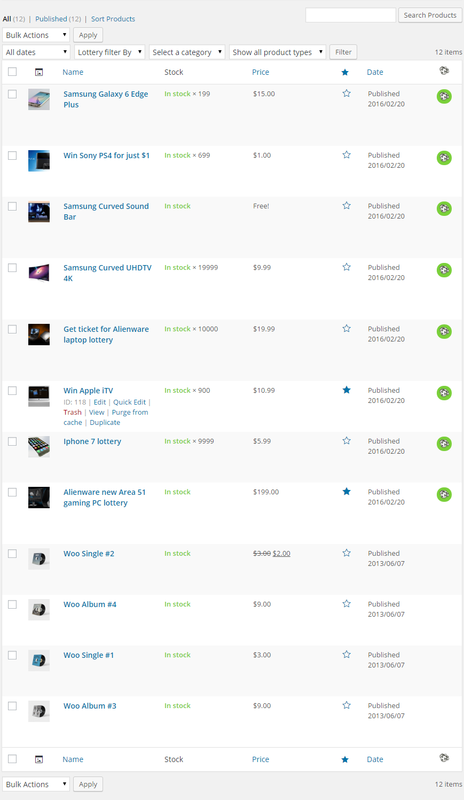 On screenshot below you can see how product list with lotteries looks like. Lottery status icon colors: red - active lottery, orange - finished, red - failed. If lottery has failed, in product / lottery details you will see "Refund" link which enables you to refund all tickets to participants if your lottery rules require that. Can users create their own lotteries? - Basically yes, only users who can add new products can create lotteries. 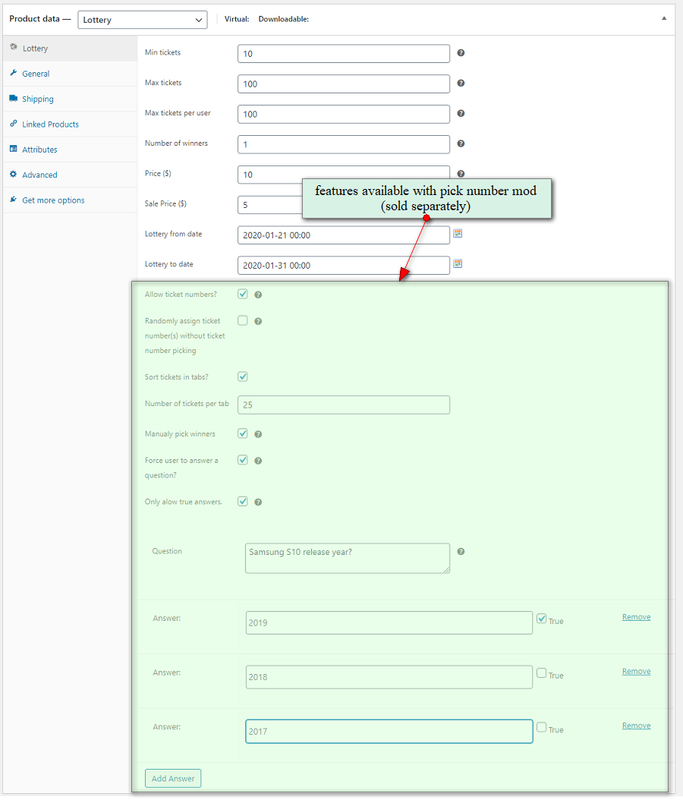 You can use multiple vendor plugin which will allow you to add users who will be able to create products (lotteries). You can use multiple vendor plugin which will allow you to add users who will be able to create lotteries. You can use WooCommerce Product Vendors (there is no frontend submission for lotteries only backend). Does Woocommerce Lottery work with WordPress import / export tools? - Yes, you can export and import lotteries with standard WordPress import / export tools that are located in Admin -> Tools menu. It's your duty to modify plugin template to matchyour style and theme. Themes can implement different ways how they customize pages and parts of Woocommerce. We cannot guarantee that our plugin will look same as in our demo for every possible theme out there. Web developing is more than getting a theme and couple plugins, enabling them and deliver web site. Our templates are coded by standards and they adhere to WordPress and WooCommerce template structure. That means that minimal intervention is needed from client side, but sometimes there is no way to avoid template changes. Some themes use similar structure and have minimal interventions in structure and our plugin looks good out of the box and some do not. It's your task as web developer and client who purchased plugin to modify and customize plugin templates to match your own (or client's) needs and styles. This is part of developing a web site. You cannot expect that everything will be perfect for every possible theme and plugin comibation out there or that we will do your job for you as part of support. We support plugin - we do not style and customize client's sites. Thanks for understanding. Right way to customize plugin's templates is to copy contest of plugin_dir/woocommerce-simple-lotteries/templates/ directory to your_theme/woocommerce/ directory and do modifications there. Where can I see winners of the lottery? - Read text and check screenshots in paragraph "Plugin options". $time = '<span class="time-left">'.$timetext. '</span <div class="lottery-time-countdown"
How winner(s) is picked? How do you pick winners? - Winner(s) is/are picked randomly once lottery is finished. Plugin uses mt_rand PHP function to randomly pick winners. PHP function mt_rand() which provides solid randomization for this purpose. Can users buy tickets for lotteries without signup / register first? - No. It is impossible to have users purchase tickets before they're logged in because we can not count consistently their previously purchased tickets only those in cart can be counted. What are custom meta fields for lottery product type (useful for CSV Product Import)? 3rd party plugin is causing problems? Its developers tell you that we need to fix our plugin? - Woocommerce extensions should be transparent - meaning one extension should work with another without introduction of special code that makes them compatible. Imagine what would happen and how much time we would need to spend if we would have to add a bit of compatibility code for every Woocommerce extension that's out there - we would end up in huge plugin with tons of problems which would be problem to test and debug. That's why we think every plugin developer should stick to Woocommerce coding standards and APIs (they're there for that reason) and not require 3rd party developers to code something into their extensions / plugins so that it could work with theirs. When client cancelled order stock is not restored? - Yes, that's how plugin works. You can use this plugin for restoring stock for cancelled orders https://wordpress.org/plugins/woocommerce-auto-restore-stock/. 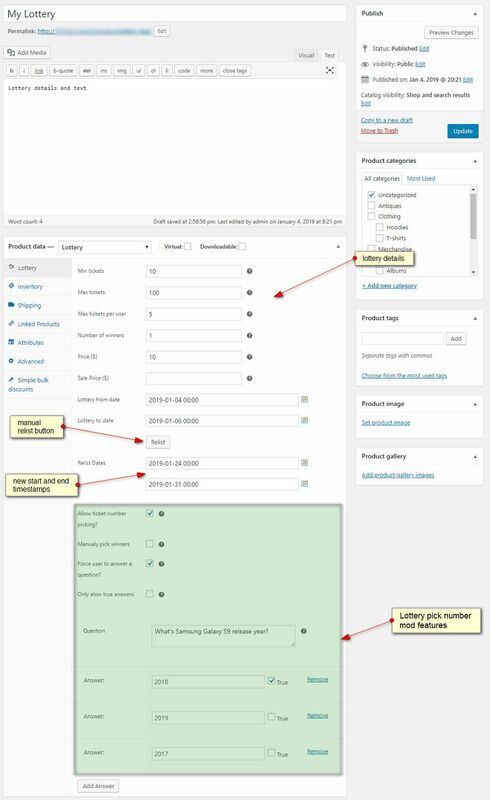 Also keep on your mind that for Lottery to work you have to enable stock management in WooCommerce Settings -> Products -> Inventory. What happens with tickets with wrong answer? - When you manually select winner you can select also winner with wrong answer. When winner is selected automatically then tickets with wrong answers will not be taken into draw process. 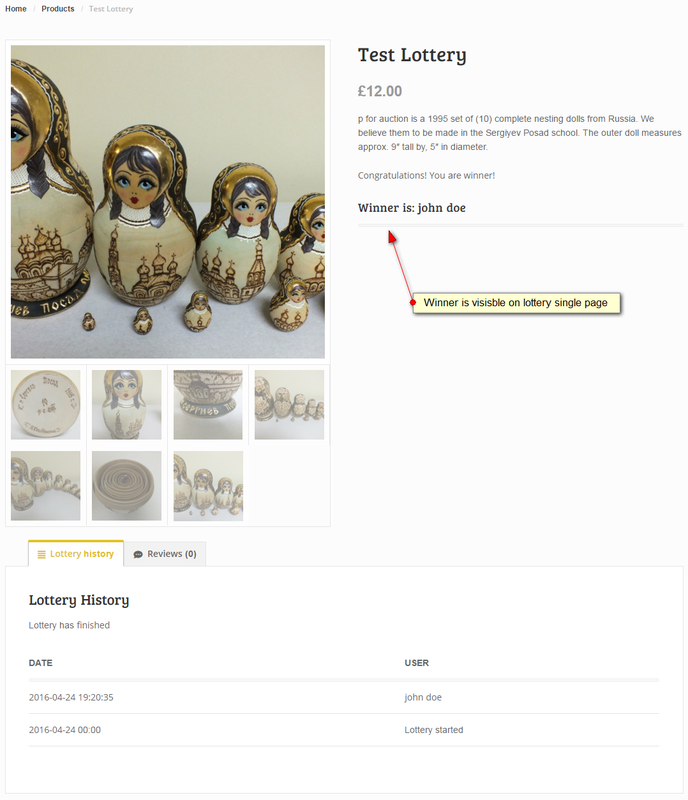 Can users create their own lotteries like for example auctions on eBay? Can I charge fee for lottery ticket sales published by users? - Yes but you need 3rd party plugin for implementing WooCommerce multivendor / marketplace. Then your users will be able to post auctions and you can charge fee for their sales. You can use Dokan multivendor plugin which has frontend lottery submissions (you need Business version or Free, Starter, Professional with Dokan WooCommerce Lottery Integration module) or Woo Product Vendors.